Most of the time you can do an outside check on your hives to see how they are progressing. Depending on the time of the year the bees will be more or less active. If there is no nectar flow, do not expect much activity. If there is a nectar flow, the stream of bees should be heavy coming in and going out from your hive. African bees are very good at cleaning invaders from their hive. They can do most maintenance tasks without your assistance. This is a brood comb from a strong colony residing in a top bar hive. Notice that the brood are laid by the queen in a circular pattern. Pollen is located just outside the brood section and honey on the far outside. Brood require more pollen (which is the protein in the bees diet) due to their rapid growth. This is what your brood comb should look like in your hive. Problem: You have many hives in one place (an apiary) and they are poorly occupied. Answer: During swarming, bees swarm all over the forest. If your hives are located in one place it will make it easy to harvest but hard for swarming bees to locate. Catcher boxes, which are small five-bar bee hives, should be incorporated in the process of catching wild swarms. These catcher boxes have bars exactly the same size and length as your full-size bee hives. These small hives should be hung throughout the area, making it easy for swarming bees to find and occupy. After an occupation occurs, this small 5-bar catcher box should be brought to your apiary and the bars transferred directly to an empty hive. Since the bees are complete with their queen and their recently made comb, they will readily accept this new location. Using catcher boxes will allow you to get 100% occupancy in your apiary. Important: Since catcher boxes are only in the forest during swarm season, they do not need to be made from durable materials. 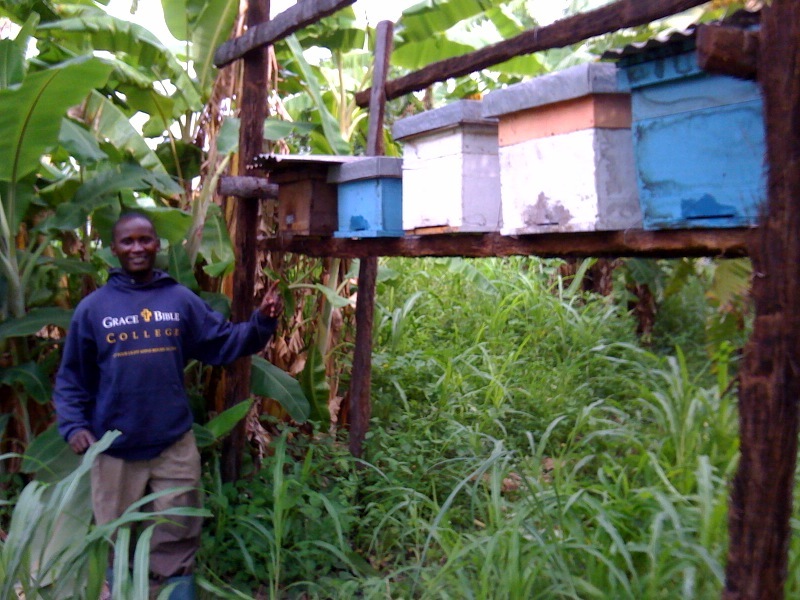 The easiest catcher box we have used was made from a cardboard box which was modified to allow the use of five full-size bars from our top bar hive. Remember, you will have to move this hive so, even if made from cardboard, it should be made well, preventing bees from escaping during the transportation from forest to apiary. The bars on these catcher boxes should be baited with wax just like you would a full-size hive. Problem: There are no bees and the entryways have been closed off. Answer: Your hive has been colonized by black carpenter ants or small red ants. Remove them and re-wax before putting your hive in another tree. Be sure you have greased the hook to your hive to ensure that ants cannot follow it to occupy your hive. Some African trees seem more attractive to ants. Look at the tree before you hang your hive. If many ants are climbing on the trunk and branches of the tree, it may not be a good choice. Important point: A two-inch section of your hanging hook should be liberally greased. Be sure you do not grease the wire you hang the hive from. If you do, you will always be getting grease on your gloves. This will taint any honeycomb you touch during the harvesting process. Problem: Your bees are angry and aggressive. You see large black beetles at the entrances of your hives. Answer: Your hive is being attacked by large hive beetles. The guards at the entryways are trying to repel them. They are more agitated than normal due to these invaders. Be sure the doorways to your hive have entrance reducers or are not bigger than 7-8 mm. Large hive beetles cannot get through a 7-8 mm gap. Reducing the entryways will ensure that they do not overwhelm the bees before they are strong enough to repel them on their own. Important point: Large hive beetles as well as small hive beetles breed in sandy soil. The hives that we have placed in areas with sandy soil have always struggled more with both of these types of beetles than hives we've placed in areas with clay-based soil. Answer: You hive has been occupied by wax moths and small hive beetles. It is probably not worth saving this hive. Wax moths and small hive beetles overwhelm weak hives, as there are not enough workers to keep the hive clean of these pests. It is important to get primary swarms in your hive by baiting and placing it in the forest early in the swarming season to ensure occupation of large numbers of bees. Smaller swarms are more susceptible to pest damage than larger swarms. Remove these weak bees, burn the refuse from the hive, and start over. Important point: Wax moths will always lay their eggs in spaces too small for bees to police. While opening your hives you may notice that the bees have propolized extensively and that there are oblong wax month cocoons in those tight spaces. As mentioned in other places in this website, bee space is important. Bees need to have the space to move freely throughout the hive as they will clean these pests from the hive when they find them. The best defense for hives is a strong colony. To reemphasize, well-built hives also help to deter pests such as wax moths and hive beetles. 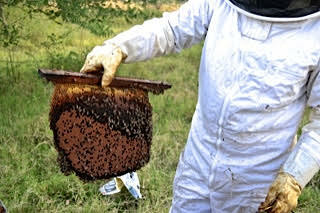 If bee space is adhered to everywhere in the hive, it will give bees the ability to police the hive and keep it clean. If there are cracks that are too small or frames that are pushed too close to the inner sides of the hive, bees will not be able to police it, freeing pests to lay their eggs and reproduce there. Problem: Your hives have been knocked over and lay sprawled on the ground. The bees are all gone. Answer: The hives have been vandalized by people. Boys who are herding cows, or people passing by may take the opportunity in the cool, early morning hours to knock your hive over. They wait until the bees leave and then return to see if they can salvage anything worth eating. Hives hung in trees can help to prevent this problem. You should report this to your local village leadership to ensure an announcement is made in the next village meeting regarding respecting personal property. 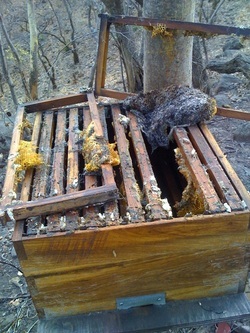 Theft of hives can be common. It is sad but due to their good construction and single entryway, a top bar or langstroth hive needs to be frequently checked. Log hives usually have multiple entryways making them difficult to steal or move because of bees defending their colony through those openings. Flenki is standing next to his swinging apiary. It is suspended with six wires which are greased to prevent siafu ants from invading the hives. These hives will be occupied either directly by swarms or through the use of catcher boxes. The goal of every beekeeper should be each hive occupied by a strong swarm. Any hives that are not faring well should be emptied and the beekeeper should start over, attracting a new swarm.